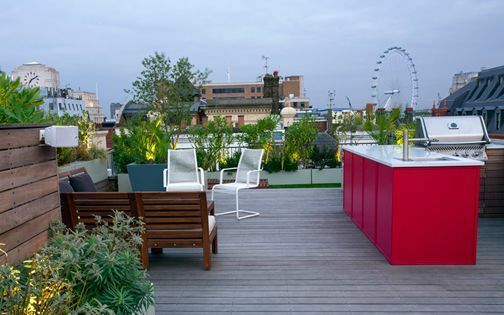 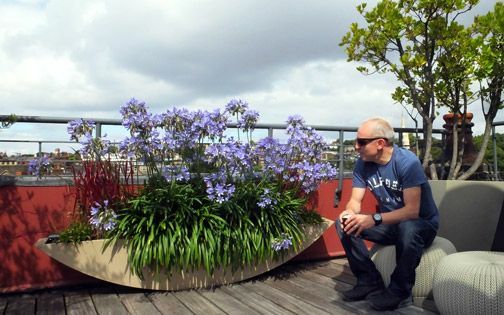 Designed for an artist, we created a penthouse roof terrace abundant in bespoke planters to highlight distinctiveness and our client's zest for dynamic colour. 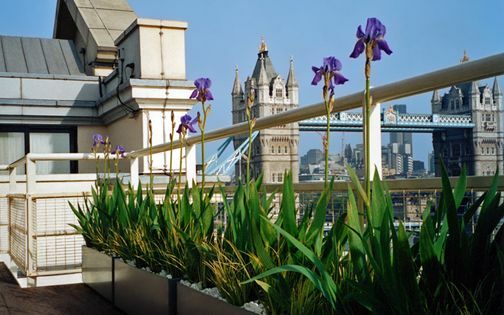 The existing penthouse decking was retained, and an automatic irrigation system installed to sustain a new, low upkeep architectural planting scheme. 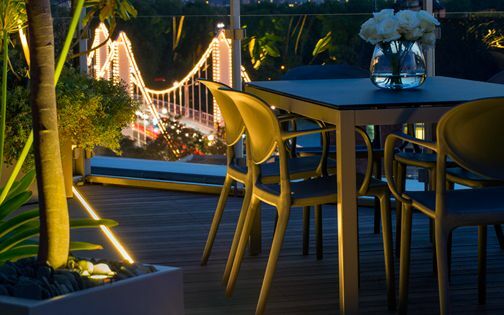 The terrace design's streamlined, fluid curvature was inspired by Anish Kapoor's ArcelorMittal Orbit sculpture in the panoramic London Stadium backdrop. 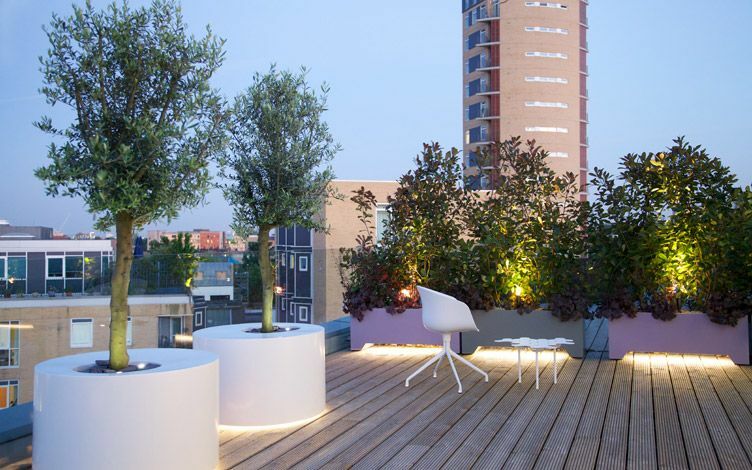 Our client's penthouse apartment atop London Fields' Arthaus is south-east facing, enveloped by views of Queen Elizabeth Olympic Park and its prominent landmarks. 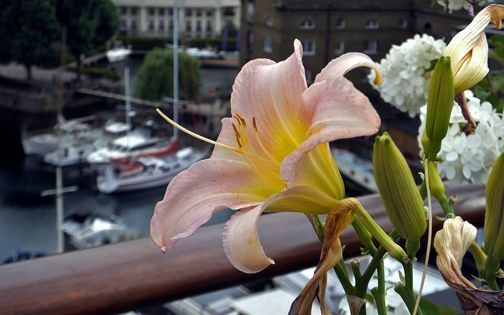 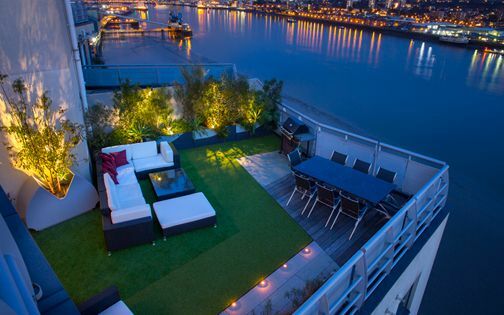 For an artist, this buoyant part of London forms an optimal location to live, work and enjoy a colourful, creative rooftop landscape design. 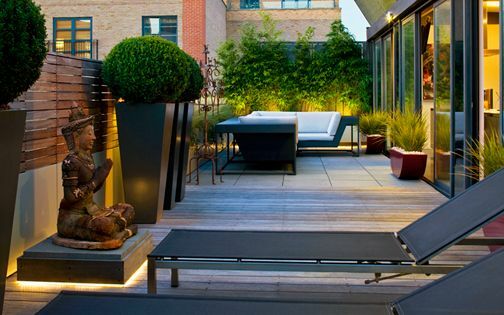 Each terrace elevation features its own visual focus in a minimalist compositional display of sculptural planters. 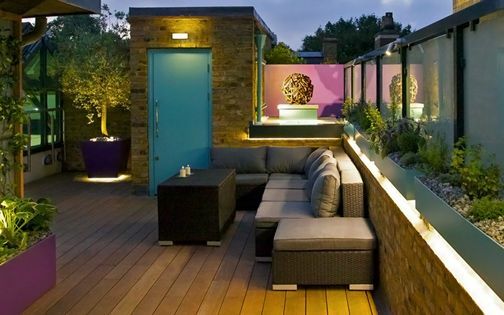 Circular shapes, recessed troughs and arched vases portray vivid colours in original one-off terrace designs, where the outlines of cylindrical Olive tree tubs were crafted with bespoke, asymmetrical apertures in pairs as a contrast to a linear roof terrace layout. 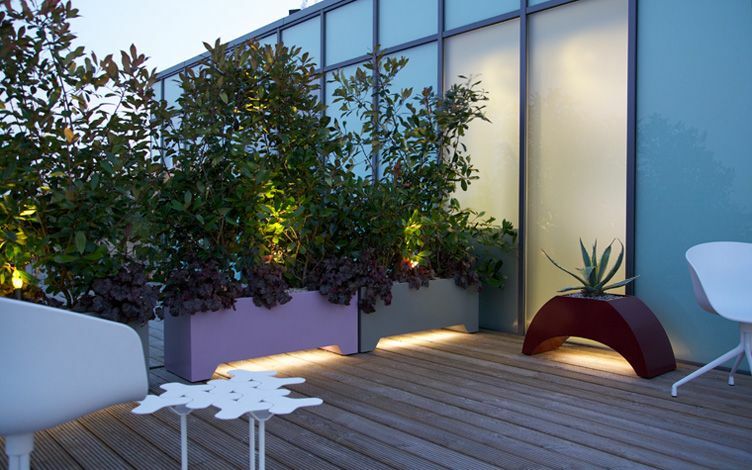 Evergreen foliage complements this bespoke architectural terrace in texture and tone with Agave, Olive trees, Phormium and Photinia. 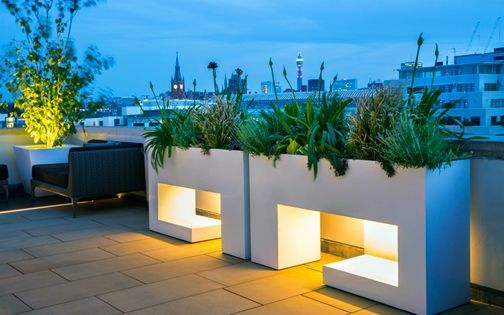 An LED lighting scheme enhances the planters' contours, set below their apertures, while a contemporary frameless glass balustrade augments luminosity, reflections and a sense of depth. 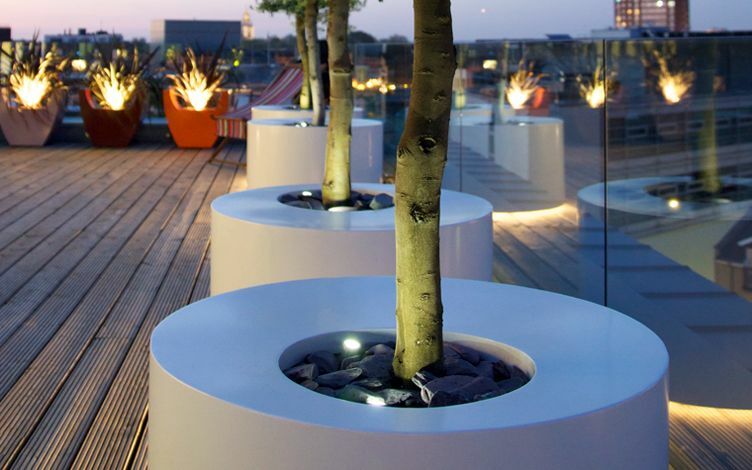 We continually strive to maximise terrace space by highlighting surface fluidity under planters and including discreet cavity lighting. 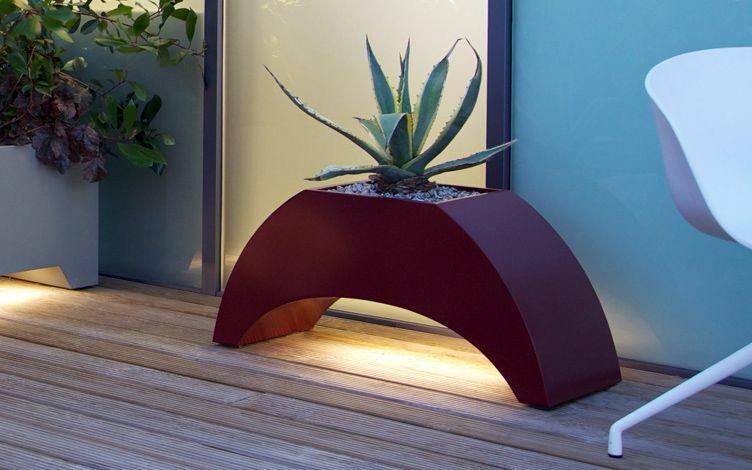 Three arched vases, positioned pivotally along the living room's vast windows, delineate minimalist uniformity to frame the view and accentuate a contrastive colour palette; their deep maroon powder-coating presents a soft sheen, while variegated Agave succulents generate sculptural essence. 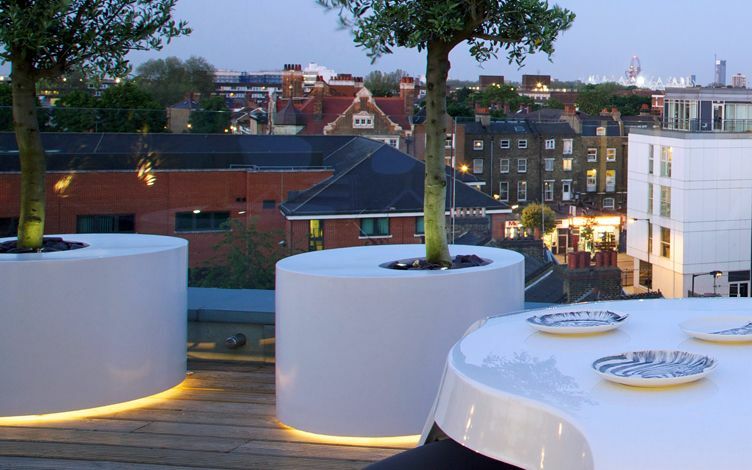 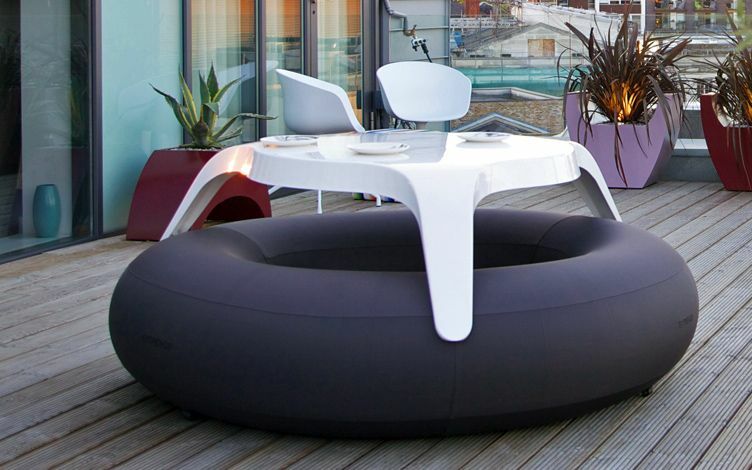 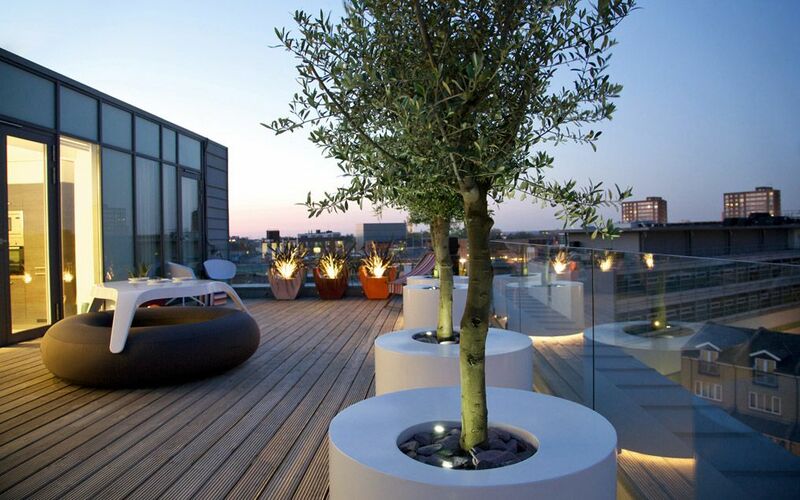 The roof terrace's symmetrical design is articulated by two pairs of circular planters which frame a dynamic London skyline statuesquely with robust Olive trees; their white exterior and smooth round profile well matched with a milky, ring-shaped table and seat. 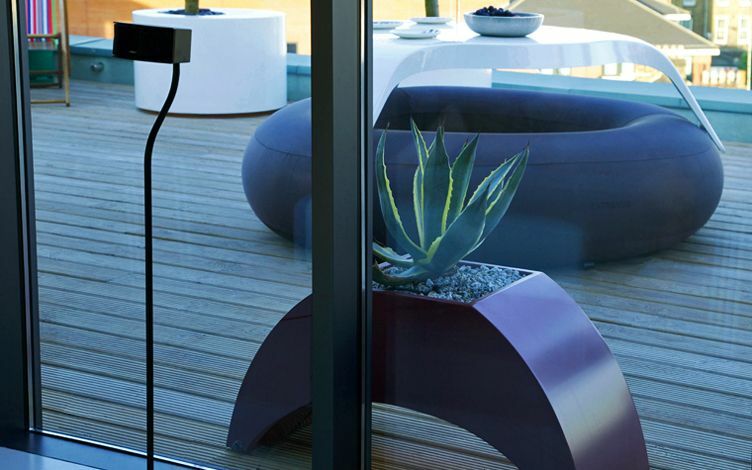 Streamlined low curved vases, featuring Agave succulents, are displayed at equal intervals along the penthouse's glazed facade to layer and graduate panoramic views, accentuated in a crimson hue. 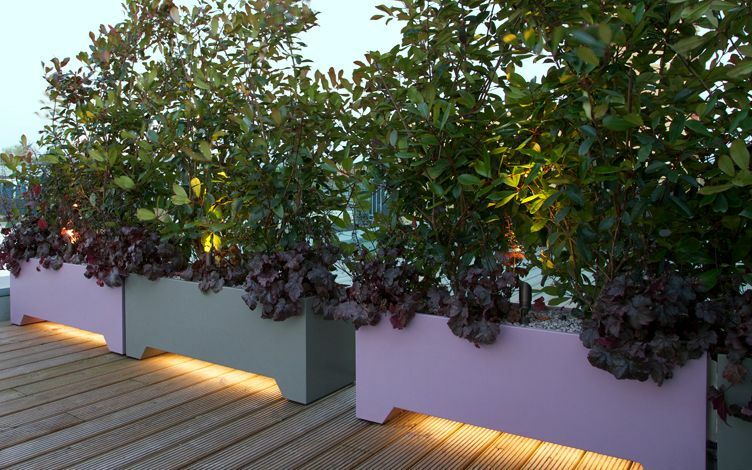 An urn trio in mauve, scarlet and orange tinting forms a unique focal point, while two duos of recessed fitted troughs alternate colour from pink to light green-grey, producing a tall evergreen privacy screen. 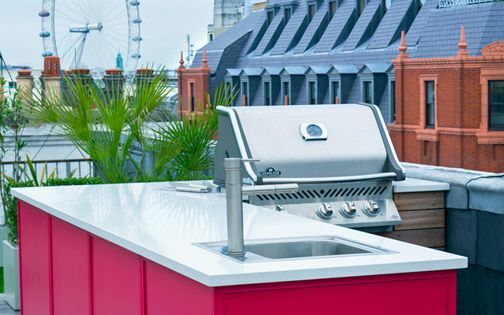 In this high-spirited live/work artistic environment, such vibrant rooftop energy, alongside copious entertainment space, enhances the zeitgeist of an urban London roof terrace and its distinct social interplay. 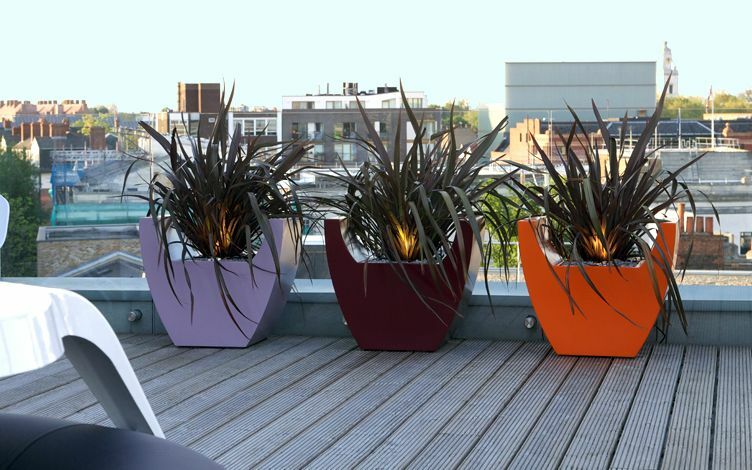 A trio of playful urns, designed for the terrace's north elevation, infuses invigorating mauve, maroon and orange hues through custom contours, sustaining innovative geometry across this highly bespoke penthouse rooftop – echoing the Olympic Park's Orbit Tower, while a grassy New Zealand flax produces graceful motion in the breeze with a bronzy silhouette. 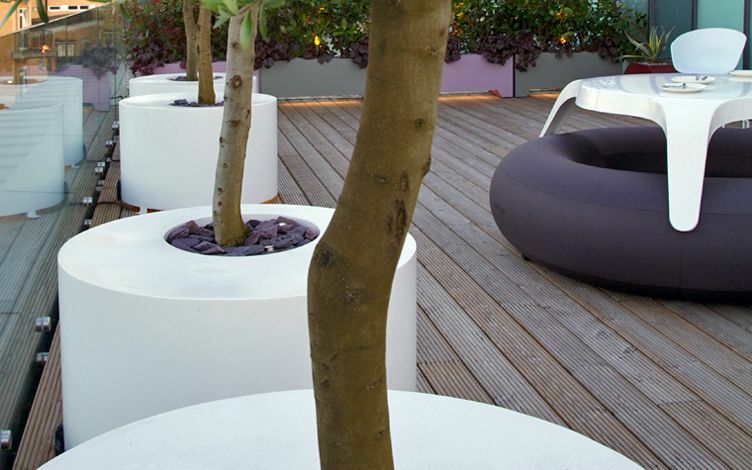 We develop unique planters for each private roof landscape design project, where their size, shape and colour define distinct foliage qualities in a personalised approach. 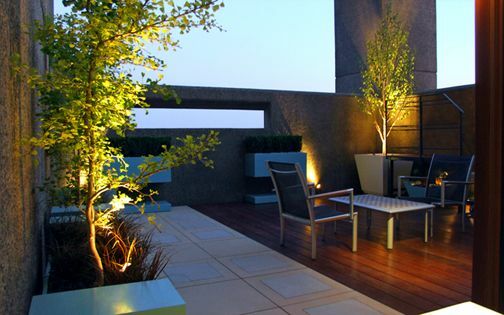 Irrigation pipes, drainage outlets and rooftop lighting are concealed integrally within these free-standing structures to provide a pristine, well-fitted finish. 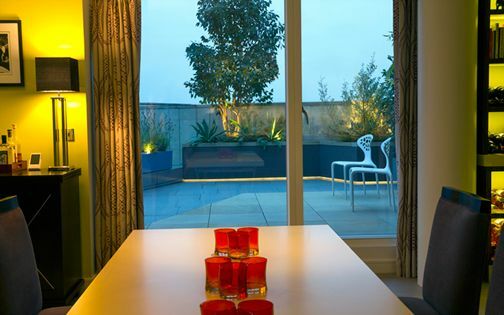 Warm light, emitted by the LED system in this penthouse roof terrace, blends effectively into translucent glass windows and balustrades to buoyantly enhance a seamlessly customised metropolitan rooftop.